The market seems marginal still, but is likely to come on fast. NEW YORK (TheStreet) -- The numbers are in for 2011. Approximately 18,000 high-performanceelectric cars were sold in the U.S. in 2011. By "high-performance" Imean those electric cars that have a top speed at least 10% above 75MPH and can accelerate to that kind of speed at least as quickly asthe average gasoline/diesel car. The 2011 electric bestseller was the Nissan (NSANY.PK) LEAF with 9,674 units,followed by the Chevrolet ( GM - Get Report) Volt with 7,671 units. Tesla ( TSLA - Get Report) and Fisker combined delivered fewer than 1,000 cars in the U.S. in 2011. In all, it is estimated that approximately 13 million cars were delivered to consumers in the U.S. in 2011. This means that high-performance electric cars constituted approximately 0.15% of the total U.S. car market. Aside from "high performance" electric cars, there are two types ofdefinitions that need to be sorted out, especially as we enter 2012.The first definition is simply the one about "electric car." My wayof drawing the line is to say that any car that plugs into a walloutlet qualifies, as long as it is high-performance. Thismeans the Chevrolet Volt, Nissan LEAF and cars from Fisker and Teslaare included. Some people will object that Fisker and Chevrolet Volt shold not be called"electric cars" because they also have gasoline engines. I don'tthink this distinction is very relevant at this stage of the game. 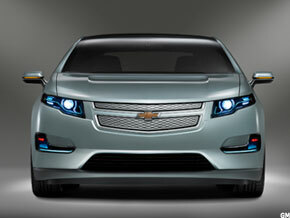 AFisker is rated by the EPA at 32 miles of all-electric range, and theChevrolet Volt at 37 miles. Both of those cars can perform across theentire performance range of the car -- maximum acceleration up to 100MPH -- without the gasoline engine turning on, up to those distances(32 miles and 37 miles, respectively). Many people don't even drivemore than 30 miles on the average day at all, so they would rarelyconsume a drop of gasoline during their regular commutes, in thosecars. In 2012, at least two cars will enter the market that will muddy thesedistinctions. Let's start with the Toyota ( TM - Get Report) Prius Plug-In, which isentering production now and should see its first U.S. consumerdeliveries no later than March 2012. It has only a small battery -- Ithink close to 5 kWh, compared to the Nissan LEAF's 24 kWh and theChevrolet Volt's 16 kWh -- and can therefore only travel approximately15 miles on a full charge. But the all-electric limitations of this car doesn't stop there. Thenature of the Toyota Prius Plug-In's architecture also limits what youcan do during these first 15 miles of potentially all-electric range.You see, the Toyota's electric motor is a lot weaker than the one inthe Nissan LEAF, Chevrolet Volt and for that matter also Fisker andTesla. As a result, the Toyota Prius Plug-In will engage the gasoline enginewhen you apply the accelerator to approximately 75% of power, as wellas probably over a certain speed, supposedly 62 MPH. In other words,despite that this car plugs into the wall, it can start acting like aregular hybrid car already after the first few seconds of driving, ifyou just apply enough power. It is therefore a legitimate question whether the Toyota Prius Plug-Inshould be called an electric car, in the same way we would otherwiseapply that label to the Chevrolet Volt and Fisker Karma. It cannotfunction without the gasoline engine. In contrast, whether it's theChevrolet Volt or the Fisker Karma, you could theoretically remove thegasoline engine and drive those cars to their performance maximums --just to 32 and 37 miles worth of range, respectively. The Toyota Prius Plug-In isn't the only car to enter the market inthis definitional gray zone. The Ford C-Max Energi will also enterthe market in 2012, and it may have a similar architecture to theToyota Prius Plug-In. I say "may" because Ford has not yet providedthe crucial engineering details that would enable us to make the finaldetermination -- but most indications are that it will be similar,even though its battery may be larger, which doesn't change thedefinitional principle here. Ford is entering the market already this quarter with the $40,000Focus Electric, an all-electric high-performance car. We really don't have a good sense of the sales expectations for this car, except to say that the geographic availability will be limited in the first half of 2012, and expanded to more states in the second half. Adding these additional 30,000 cars, we arrive at a U.S. market-widetotal of 122,000. Some lower-performance all-electric cars from Smartand Mitsubishi will likely add a few thousand units, yielding a totalcloser to 130,000, or approximately 1% of the U.S. car market. In other words, we are talking about a U.S. market-wide growth rate ofthis segment from 2011 to 2012 of approximately 600%. How many 600%growth markets do you know? Yes, people laughed about the iPhone in2007 too, but by the end of 2008 they weren't laughing anymore.Certainly not in 2009 or 2010. These markets are small now -- stillhaven't hit 1% of the total market -- but they come on fast, in a fewshort years. Electric cars are currently more expensive to make than puregasoline/diesel cars. Of course, electric cars are also cheaper tooperate, given that they are more energy efficient, as well as thelower maintenance costs. An electric car has so dramatically fewermoving parts and reduced mechanical complexity, that you should beable to save close to $1,000 per year or in many cases more over thelonger term. One unanswered question with respect to cost is the eventual batteryreplacement. We don't know what these batteries will cost eight or 10 ormore years ago into the future, when a replacement will eventually bedue. This could be a significant variable, but eight years is a long timein technology, and we know what technology has done to the cost ofother things in life. In the future, the arguments in favor of electric cars are likely toshift to their silent and smooth operation. Basically, electric carsmake for superior luxury. Once you have driven an electric car,returning to a gasoline/diesel car feels very agricultural with alltheir noise, shakes, vibrations and lack of smooth operation. In the near term, electric cars are likely to be focused on theperformance and luxury segments. Over time, as battery cost declines,this luxury technology will be accessible to a greater percentage ofautomobile buyers. Perhaps then, the electric car market share willgo from 1% to something more like above 50%. That will likely take atleast another five years or more. Anton Wahlman was a sell-side equity research analyst covering the communications technology industries from 1996 to 2008: UBS 1996-2002, Needham & Company 2002-2006, and ThinkEquity 2006-2008. F5 Networks revenue expected to rise 2.6% to $547 million.